Hunting down games to review or preview is as easy as looking at online retail lists of upcoming games or fire up a web search to see what’s cooking in the development world. Coming up with good ideas for articles and columns, on the other hand, takes a lot more effort, but it doesn’t have to be a total drag. There will be times when your creativity wanes and good ideas don’t come as easily. You can overcome these mental droughts with a little research and some brainstorming. Here are a few quick tips on how to get the noggin juices flowing and track down leads for ideas to pitch. You should be doing this anyway to get a feel for each publication’s style and the kind of content it runs. But even if you’re not planning on pitching a particular outlet, pick up a copy or hit up its website on a regular basis anyway and see what other folks are writing about. You might stumble upon some unexpected tidbit of information (a game you hadn’t heard of or a fresh angle you hadn’t thought about) that spawns an original idea you could turn into a good feature pitch. Do you have interests outside of video games? Sure you do. Whether you’re into music, food, gardening, llama farming, heavy drinking, collecting taxidermy, or some other obscure pursuit, your favorite hobbies can be excellent sources of inspiration for article ideas. You’d be amazed all the ways you can use your other passions as a springboard to concoct interesting pieces to pitch editors. The trick is to look at them through the lens of the gaming industry. Dig fine cuisine? Come up with an idea revolving around cooking games. Like underground music? There are a slew of bands and performers out there writing bizarre musical tributes to their favorite games. Find a way to plug your favorite non-gaming topics into the gaming realm. There’s so much random information available at your fingertips that it’s hard to know what you’re looking for until you find it. Sometimes the best way to uncover a treasure trove of article ideas is to start running random Google searches on various subjects combined with “video game” (or some gaming-related search terms combination). It’s a quick way down the rabbit hole into a whole realm of curiosities that can lead to awesome sources for features. Who knows what the hell you’ll come across? Take ideas from articles you’ve written previously and re-tool them with a new topic. It may sound cheap, but who cares? There’s nothing wrong with recycling familiar topics from old pieces and updated them with a fresh spin. This can be as simple as swapping out the subject of a piece or revisiting the same topic from a different angle. Some types of stories, like profile pieces and round-ups, can be done annually too. Year-end retrospectives, like the “The Craziest Games of 20XX,” are a good example, since you can write these pieces over and over again an infinite number of times with different games slotted in. Sitting down to an epic brainstorming session can yield an abundance of ideas, and one of the best ways to cultivate them is to write everything down as it comes to you, no matter how stupid or silly it may seem. When your brain is on the dry side, pour some fuel in the old gas tank by letting picking a few key topics and then start spinning out lists. Generate a big list of once-sentence ideas exploring different angles until you’ve exhausted every possibility, then take a moment soak everything in, pair ideas together, and keep the best ones to develop further. Even if you’re not much of a news hound, stay tuned-in to the weekly news cycles in the gaming press. Keep your eyes open for hot trends or topics that are generating buzz, and once you’ve locked in on something interesting, find a way to build an article or series of articles around it. These kinds of pieces are easy to pitch to editors, since they’ll be keen to commission pieces with any fresh angles on such stories that will bring in lots of traffic for their outlet. Fact: people love to read about other people. Human interest stories are popular in mainstream media, and they exist in the gaming world too, though they may take a back seat to AAA previews and big announcements. There are lots of interesting people out there to interview and profile. Seek them out, learn their stories, and find a way to share them. Look beyond the usual well-known game developers and media personalities, and find fresh, compelling angles to weave their gaming-connected tales into killer features or profiles. 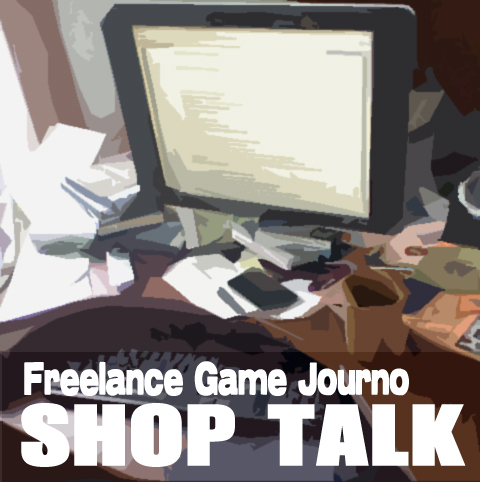 This entry was posted in Freelance Game Journo Shop Talk, Up Up Down Down Left WRITE and tagged @nmeunier, advice, book, freelance, game journalism, game journalism book, getting idea for articles, how to be a game journalist, kickstarter, nathan meunier, shop talk, tax advice, up up down down left write, writing by nmeunier. Bookmark the permalink. Excellent post, sir! I love these advice columns, whether it’s Shop Talk or Ask The Freelance Dude. Tons of great info, and they all seem so inviting and encouraging, which is just what an aspiring writer needs when they’re starting out, haha. Thanks for the tips, and I hope your book gets funding! Thanks Andrew! Glad I could be helpful and that you’re digging the pieces. I’ll be putting a bunch more up in the coming weeks to help promote the book project. I hope gets funded too, as it’s going to be really awesome when it’s all completed. I’m an über noob in this Blogging territory, and have recently began my own blog focusing on console gaming/mobile apps, etc.. I’ve been reading your blogs along with anything else I can learn in hopes of learning writing techniques and tips. You have great info and are exciting to read! Thanks Nate good luck w/your book!